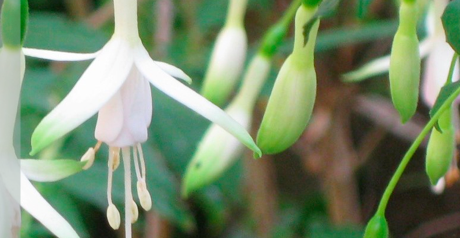 Fuchsias don’t have to be over the top with huge double flowers the size of wadded up tissue. Nope. This is one of the very best and it makes due with profuse all white flowers- the tips of the sepals are dipped in green. Vigorous hardy Fuchsia that reaches 4′ x 4′ in a single season in rich, well drained soil with consistent summer moisture. Full sun (but with regular water and no reflected heat) to part shade. Masses of pendulous flowers appear from June to October. Loved by hummingbirds. This light airy sub-shrub combines perfectly in lush borders or as a single stunning specimen. Dies to the ground below 20ºF- re-sprouts from the base vigorously in spring. Easy, hardy, beautiful.